Authors of The Gefilte Manifesto, Jeffrey Yoskowitz and Liz Alpern. Photo credit Lauren Volo. 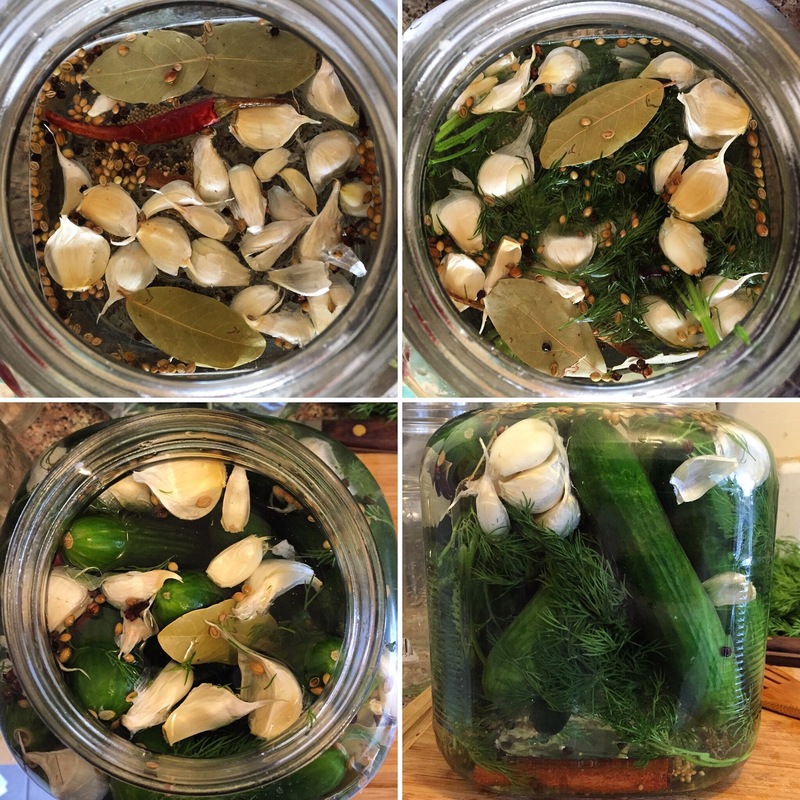 Arrayed in front of me on a table in the Silverlake Independent JCC in Los Angeles were bottles of vodka, gin, dry vermouth—and lacto-fermented sour pickle brine. Liz Alpern and Jeffrey Yoskowitz were about to teach us how to make “Sour Dill Martinis” as part of the book tour for their recently published cookbook, The Gefilte Manifesto: New Recipes for Old World Jewish Foods. It took me exactly one sip to embrace their gefilte revolution and within weeks I had my first homemade batch of “Classic Sour Dills” and—just as importantly—my own homemade pickle brine to shake (not stir) into my martinis. In the words of their manifesto, this cookbook is about “reclaiming our time-honored foods and caring how they taste and how they’re sourced. It is about serving a dish with pride, not simply out of deference to hollow convention. It is about taking food traditions seriously and reclaiming the glory of Ashkenazi food—what is has been and what it can be.” The book includes clear step-by-step instructions on how to prepare traditional Ashkenazi dishes in a modern kitchen and for today’s palate, and it’s full of stories from Liz and Jeffrey’s personal experiences, from their families, as well as from sources in Yiddish literature and history. The book emphasizes making things from scratch and using everything you’ve got. It starts with a section called “Pantry Staples,” recipes for essential elements of many of the recipes that follow including sour cream, vinegar, and schmaltz. It’s thoroughly researched, thoughtful, and respectful both to tradition and to modern realities, and most importantly, the recipes are delicious. I talked with Liz and Jeffrey in the midst of their tour about reclaiming tradition, reinventing tradition, and how my pickles turned out. 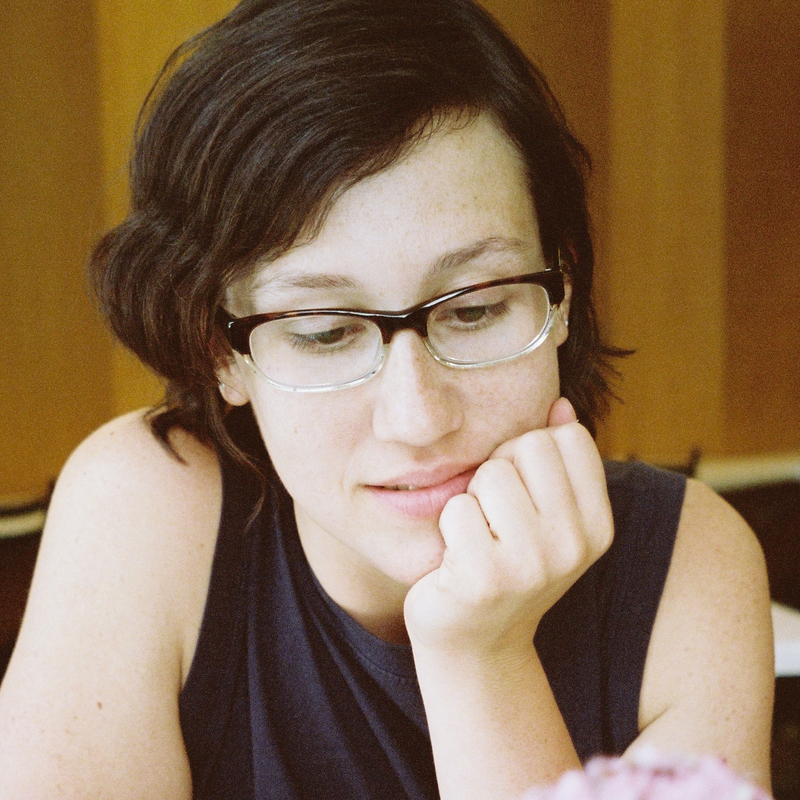 1 1 Our thanks to Sadie Gold-Shapiro for transcribing this interview and providing pictures of their own cooking adventures inspired by The Gefilte Manifesto. Madeleine: Okay, my first question for you guys is about the idea of a manifesto—you call the book a manifesto, and it begins with the manifesto that you wrote when you were starting Gefilteria. I’m interested in that because I study modernist literature and the modernists love manifestos, every project starts with a manifesto. But I imagine that’s not necessarily the most common way to start a cookbook, so I’m curious if you can tell me more why you felt like it required a manifesto to start this project, and why that’s continued for you with the book. Jeffrey: I really appreciate the question. You’re right, it’s not the way to start a cookbook. And we didn’t write the manifesto with a cookbook in mind. We wrote it when we were just beginning to cook together, envisioning starting the Gefilteria and getting into the spirit of Ashkenazic cooking. So we penned a manifesto that laid out our mission statement. It’s a four-paragraph statement that we include at the beginning of the book that we used to hand out on postcards when we were selling gefilte fish and going to events. Really it was saying we want to make this food relevant again in our lives. It was staking our claim. 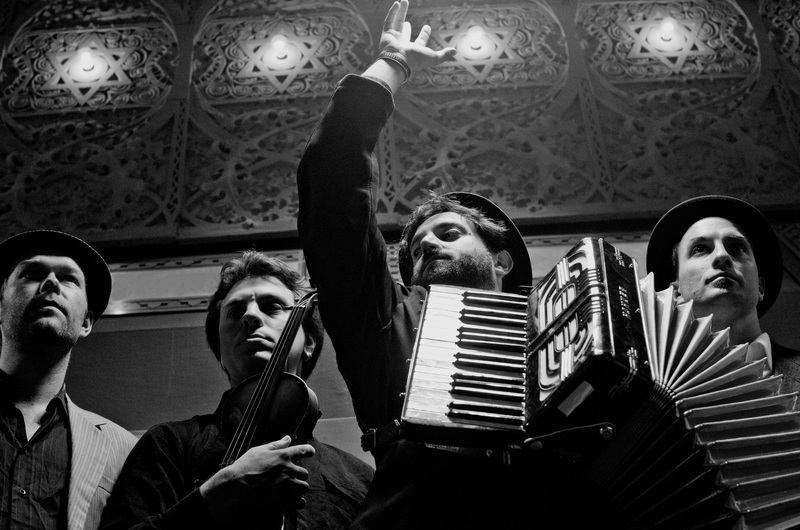 At the time, around 2011, and to this day it still feels radical in an environment in which many Ashkenazi Jews are not proud of their cultural or culinary heritage. I use the term “falafelization”; Israeli food, and Middle Eastern food and North African food are much more popular even among people of eastern or central European descent. We didn’t want to combat that, we love those foods also. But we really wanted to say that our culture and our food matter. Making our own gefilte fish back then, in our mid-twenties, that was a big deal. So we wrote the manifesto, and a few years later after having started the business and doing events and collecting recipes and hearing stories and doing years of research—we decided to turn that manifesto into a book. And it wasn’t even obvious right away that it would be a cookbook. We wanted to empower our generation to explore their culinary heritage a little bit deeper. And it turned out that a cookbook was the right way to do that. But it’s a narrative cookbook, so there’s a lot of storytelling and weaving together bits of history and little bits of literature to create what we felt like was a coherent gastronomic picture. M: I noticed that approach in your introduction to the beverage section, Liz: you connect a history of Jewish tavern keepers in eastern Europe to the Bronfman family in Montreal and your own first experiences of a good l’khayim around a tish. So you’re also connecting Jewish cultural history in Europe with the way it changes in the Americas, and then how that manifests in your own lives. Liz: Yea, a lot of what we wanted to do in the cookbook was remove these foods from the holiday table. Most Jewish cookbooks are structured around the Jewish holidays, for good reason, that’s when people “cook Jewish.” We were interested in a 365-day-a-year lifestyle. We were interested in living this, because in the past you wouldn’t just make Jewish food on Rosh Hashanah, this was every day of your life. And when we tapped into some of the wisdom and the stories and the history we realized there’s more here for us than just a collection of random holiday foods and days when we all come together. There’s a daily wisdom in this, there’s a rhythm to this, there’s l’khayim on a Tuesday. That’s part of the manifesto, saying holiday tables should be extra delicious, but it’s about looking at your weeknight, about looking at the cabbage harvest in the fall and connecting that to your ancestors who made cabbage in their shtetl. And going to a bar and thinking, this isn’t crazy, this isn’t not part of my history, there were generations of Jewish tavern keepers, so it’s about connecting those points beyond just a few times a year. Bialy by Sadie Gold-Shapiro and friends. M: The book does such a nice job of reminding us that traditional food practice is an extension of lifestyle and the circumstances in which you live. So like, what are the harvest cycles? What are the things that grow where you live? What are the best ways to preserve what you have? And so I’m curious, what do you think it means to pay attention to those things a little bit more than many of us do, given the fact that something as ubiquitous as refrigeration has removed much of the essential need for trying to, say, preserve fish as long as it can last. Do you think there’s still something we learn from those food processes that are connected to natural cycles and preservation? Or, what changes when that survival drive hopefully isn’t as much of a motivation for food practice as it might have been? J: Wow, I think it’s a fantastic question. I mean that’s a big challenge. One of the things we wanted to do was figure out how these foods and traditions are relevant to us. You know, we have the benefit of living in New York with really small refrigeration and not much space, and sometimes, you know, living with roommates. And so, you have to be really economical about what gets in that fridge. Canning takes on a much bigger importance in that situation. But, no, you’re right. One thing that we kept on finding with refrigeration, but also with American abundance and excess, with the ability to have fruits and vegetables all year round, was the question: why preserve foods when they’re always in season? I think that’s one of the reasons why we’ve lost a lot of these traditions. One of the nice things, and one of the confluences that brought us to this book, this journey, was — I moved to Adamah, the Jewish organic farm, and learned to pickle and preserve and there was this back to the farmers, back to the land movement, and farmer’s markets starting up. And if you want to make the most of your farmer’s market produce and you live in a place like New York, or anywhere in the Northeast, or the Midwest, you need to make jam from those berries. You need to pickle those vegetables. Otherwise, you’re going to have to go to the supermarket. And I think the way that our society, or at least the bubble in which we’re living has changed in the past decade is that some of these practices have become far more useful and relevant, and also just more in vogue. We’re no longer doing it just to survive, but we’re doing it for environmental reasons. We’re doing it to be resourceful economically, you know, if you have a CSA you want to make the most of it. We’re doing it for ethical reasons. And of course, we’ve been going around the country and meeting with Jewish communities, and it’s not the case in most places that people are living this way, but we’re seeing that change. We wanted to adapt these food traditions, to adapt Ashkenazi cooking to our modern values, but as we dug deeper into them we realized, oh wait! Our modern values are actually rooted in these traditions. M: It’s fascinating to see how things come around. You think that you’re developing a new value, say of considering the environment in farming, and you realize it’s actually an old value. That raises another question for me: So obviously cuisine and food culture, like other parts of culture, are always changing. These aren’t static things, and a lot of what you’ve been talking about so far is about rediscovering food traditions, readapting them to our lives, but there’s clearly also a lot of innovation in your cooking. I’m thinking about “Rachel’s Buckwheat Bread,” a gluten free bread recipe, something that we wouldn’t have found in a cookbook a century ago, or I don’t know, you tell me. So I’m curious, do you feel like there’s a tension between food and tradition, or using food to discover tradition, and food and innovation? L: I think there’s a lot of tension between food and innovation. One of the things that we find ourselves—I wouldn’t say up against—but one of the things we find ourselves stumbling on a lot is people who are really interested in fusion cuisine, or making things crazy and kind of a spectacle in food. You know, there’s a lot of spectacle in food now. L: Rainbow bagels! Or even matzo ball pho, you know, genre bending or spectacle making in food, and you put it on Instagram and a zillion people like it but no one ever makes it. So we see a lot of that and while we think it’s fun and playful, and that’s great, we generally shy away from that because it doesn’t create practice in people’s lives, and it certainly doesn’t last. So we keep things simple for the purpose of making things integrate into your life and that’s what we like to do. But we also recognize that things need to update, things need to evolve. And so we’re not static. We have a kimchi recipe in our book which is certainly Korean, but it’s an Ashkenazi kimchi. So it’s using a technique that is not foreign to the Jewish kitchen, and it’s mainly using ingredients that we would use in the Ashkenazi kitchen like radishes and cabbage, but it’s a little bit more kimchi-style. It’s a twist without being something that’s crazy or spectacle-driven. And you use it to make kraut, to make stuffed cabbage, and you know stuffed cabbage has been made for centuries with sauerkraut on the bottom of the pan, so it’s not crazy to put kimchi on the bottom of the pan and add a little kick. And people like spice today, it’s something that’s gaining popularity with our generation as we speak. So that totally makes sense. It’s innovation without spectacle. Without putting something shiny in front of you just so it catches your eye. J: I think we try to couch all of our innovation in the essence of these dishes, and not to create something new for newness’ sake, but to get to the heart of what these food traditions actually were or what they could be. 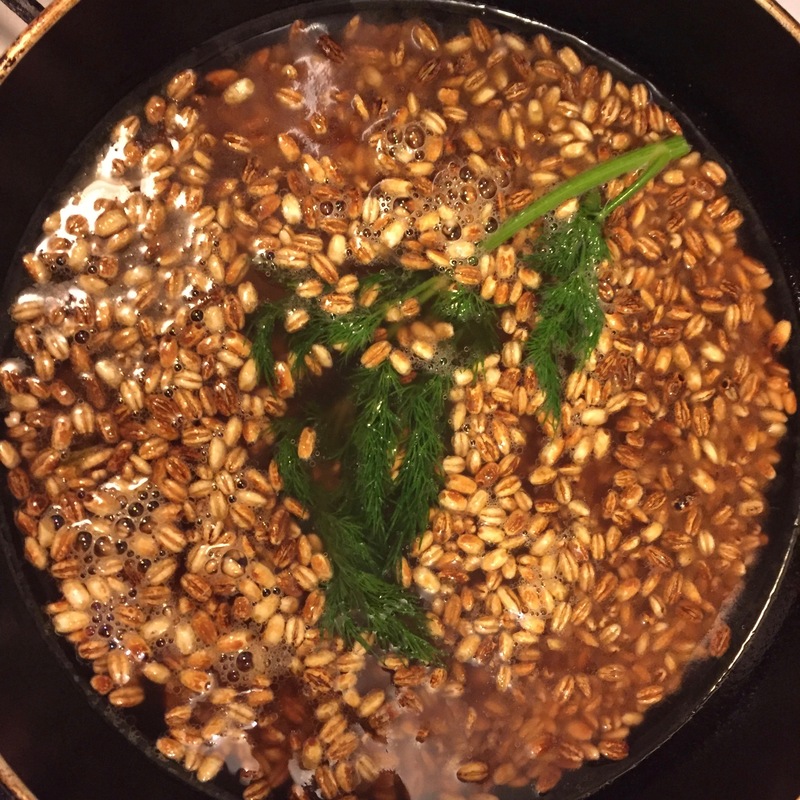 One of the most innovative recipes in the book for me is lettuce kvass. We had been given an academic paper on this tradition of Jewish pickling and fermenting of lettuce in the 1930s in Poland and Lithuania. And we had no recipe for this, so we just began playing and developing one and finding a new flavor that we hadn’t experienced. And just a week ago, a company that makes kombucha in Philadelphia started making a lettuce kvass. And they credit us, they were inspired by the book. We posted a photo of the bottle on instagram and they actually call it “Long-Forgotten Lettuce Kvass” and to me, that’s the innovation that I’m most proud of. “Mindl’s pickles” coming soon to a deli near you. 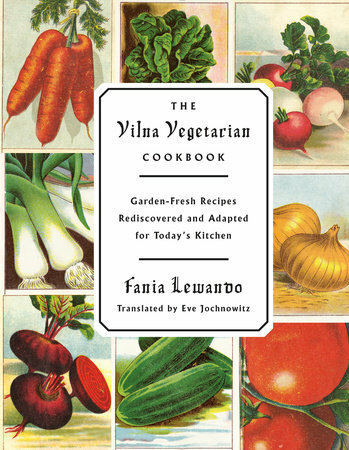 M: You mention in the book a few times the recently translated Vilna Vegetarian Cookbook by Fania Lewando, which is from the 1930s, so it’s already in a period that’s not the same necessarily as traditional shtetl cooking and Vilne is not a shtetl. But it seems like it must have been a rare resource to have this new English translation of a Yiddish cookbook. J: They’re challenging. Yes. Only because this is written for a different kitchen, a different audience. There’s so much assumed knowledge that isn’t included in the recipes. When we teach a class at Brandeis, a pre-college class in the summer, we use the book and it’s quite an exercise in using a cookbook as a primary resource to understand who and what was being written for and how cookbooks have evolved. Some of the recipes just say, “mix up some eggs, put in some leeks, and cook like a frittata.” But we got to play with them. We made a blueberry soup and the one from Lewando’s book is so different from the one in our book, but we loved the idea of the fruit soup in the tradition and we wanted to honor the role that blueberries played, specifically in Polish culture. We were both there in the summertime, during the blueberry harvest, and we were really inspired, so we took that recipe and played with it. But we just mined that book for its wisdom, for its ideas, and even for what vegetables were around at that time. We have a recipe for leek soup in our book and there was this older woman in her eighties in New York, and she makes the soup and she swears it’s an American soup that she makes, and when I tasted the soup, it reminded me of a European soup. But she says, “Oh, there were no leeks in Europe. There were no leeks available,” and I was holding The Vilna Vegetarian Cookbook, saying “Look! There’s a leek. There’s a leek frittata!” And you know, maybe they weren’t available where she was, but they were being grown. Those little nuggets are just the best inspiration. We had a lot of conversations with the older generation too. My grandmother plays a prominent role in the book because she has such a good memory of life before the war. She talked a lot about it and a lot about life during the war, but a lot of families grew up not talking about those things. She made sure to always tell us stories and to always give us a sense of where she’s from and what life was like on a daily basis. And we spoke with a lot of other elders as well. We tried to feature some of them in the book, but those conversations were starting points for us. M: You mentioned how being in Poland for the blueberry harvest made a big impression on you both, so I’m curious if you guys find inspiration or feel connections to non-Jewish eastern European cooking practices. Either traditionally, from the time period when that was the center of Jewish life, or contemporary, non-Jewish eastern European cooking. 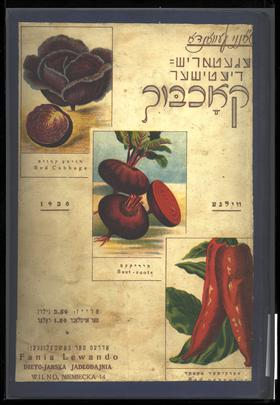 L: Jeffrey and I both traveled to Poland in the course of writing this book, and one of the things that you discover is that some of the foods you thought were Jewish are not necessarily Jewish, or purely Jewish. People are really interested in what is “really” Jewish. We get that question a lot. And Jeffrey and I have a debate about it in the book, but overall, we’re not obsessed with what’s “really” Jewish; the idea that this thing is exclusively Jewish, or this is a Jewish food. The parallels between eastern European cooking in general and eastern European Jewish cooking, they’re important. They’re important because they’re about the land, they’re about what’s available, seasonality, and so I think you learn a lot from just thinking that way and not being obsessed with what’s Jewish only. When you remove some of your own preciousness about these dishes, the cuisine starts to make more sense, actually, because you start thinking about what the seasons are in Poland, for instance. There’s a reason why we’re all making pickles or sauerkraut at a certain time or year. And then of course there’s one example in the book that really stands out: we have a recipe for żurek in the book, which is a very traditional Polish soup. It’s kind of everywhere, this sour rye soup, and it’s a soup that was certainly not on any Jewish table because it’s generally made with pork, with pork sausage, or with ham in the stock. And Jeffrey and I kept seeing it, and we thought that this is such a perfect food for our book. You use the sour rye ferment that you’re using to make bread to sour the soup. This is so in the mentality of what we do, and so we worked on a version of the soup that does not have any pork. It’s actually vegetarian and it’s one of my favorite recipes in the book because it does connect those two traditions so directly. And all of a sudden this food that was not Jewish can also be in a Jewish space. I like that, and I found that people have a really positive reaction to that as well because it crosses a bridge that isn’t normally crossed. M: One final question, is there one recipe that each of you is especially excited about or in love with right now, and/or should be the next thing that I try? I did my first salt water pickles a few weeks ago. 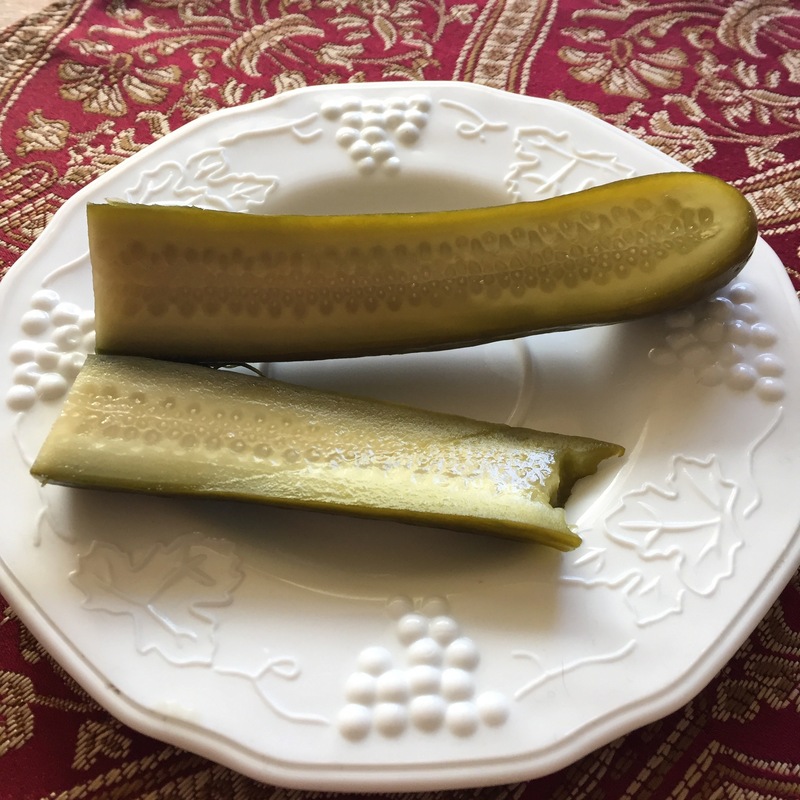 M: And then I made “Pickle Brine Bread” from it, and many rounds of the pickle martinis which are a new favorite in our house. I think that’s it though. L: You did it. You’re really doing it. M: I have done only pickle brine related recipes so far. J: Oh my gosh, that’s my dream. M: So what’s a favorite that you especially like to recommend that people try? L: The “Mushroom and Barley Soup” is one of my favorites right now. I know that you are in Los Angeles, so you are perhaps less … less moving towards soup weather, but on the East Coast, we are definitely in soup season. I’ve been making this soup quite a bit at different events we’ve been doing, and people have really been loving it. It’s always been one of my favorite recipes in the book. Both because it’s nourishing and it’s warm and it’s comforting, but it’s also light and it’s not hard to make. It really tastes like that earthy shtetl taste because you have those rich dried mushrooms, which is such a part of eastern European Jewish cooking. J: My answer changes every time I’m asked. I get really excited about some of the most basic simple things in the book. We’ve been making a lot of blintzes at events, which means we’ve been making a lot of cheese and showing people how to do that. And whenever we make farmer’s cheese, people just get so excited. That’s from the pantry staples chapter and I feel like that chapter is best for people who don’t like to cook that much, or don’t have that much experience. It can be really empowering to make applesauce. It’s really empowering to make sour cream. And it’s so simple, so easy, and really sheds light on the “how” of these foods. Along those lines, just yesterday, we were cooking dinner, and the fourteen year old son of the woman who hosted it—he made butter! These are the things that once you know, once you get started on the right foot, you can take things really far. I’m really hoping people get started with the pantry staples, and are inspired to eventually take things to the next level. But, at the very least, you have great butter, and great sour cream, and great applesauce. It’s so enjoyable. And I will say, my favorite quote in the book is the Peretz quote in the sour cream header note. M: People will have to track down the quote to understand the importance of their sour cream! Butter à la Sadie and friends. 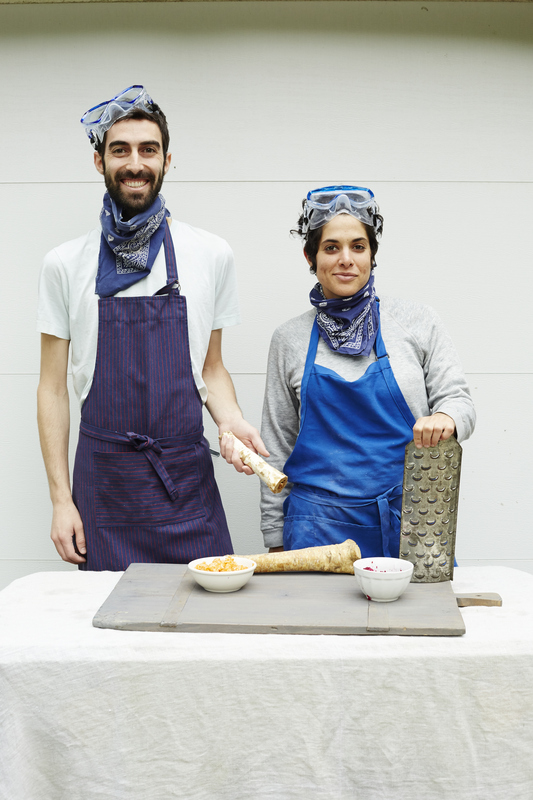 Our thanks to Sadie Gold-Shapiro for transcribing this interview and providing pictures of their own cooking adventures inspired by The Gefilte Manifesto. Cohen, Madeleine. “The Gefilte Manifesto.” In geveb, February 2017: https://ingeveb.org/blog/the-gefilte-manifesto. Cohen, Madeleine. “The Gefilte Manifesto.” In geveb (February 2017): Accessed Apr 22, 2019.